Whispers in the Loggia: "Et ecce ego vobiscum sum omnibus diebus...."
These days, for much (if not most) of the universal church, today is the Thursday of the Sixth Week of Easter. But here in the east of the States -- and Nebraska -- it's still Ascension Thursday. 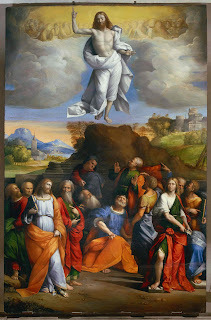 In that vein, for those of you on the delayed timetable -- who, clearly, the Good Lord loved so much he hung around for three more days -- feel free to delay reading on 'til Ascension Sunday. I had the chance to reflect on today's feast a few weeks back while exploring the Episcopal cathedral of New York, St John the Divine. Soaking up the exceptional architecture and scope of the place, an hour or so passed before I made it to the baptistery as the sound of a visiting choir singing Latin motets on a weekday afternoon wafted in from the cavernous nave. Looking up at the octagonal ceiling, its frieze engraved with the Gospel of Matthew's account of the 40th day following the Resurrection, the segment staring me right in the face just happened my favorite part of the text: "...and, lo, I am with you alway." That's the King James rendering, of course, but it's those kind of little moments that mean a lot. More than just sometimes, in the midst of everything, that message can be a little tough to remember, a little hard to believe, and oftentimes (at least for me) quite difficult to feel worthy of it. In the other Ascension account, the first chapter of the Acts of the Apostles that's today's First Reading, Jesus' last utterance to his disciples is that "you will be my witnesses in Jerusalem, throughout Judea and Samaria, and to the ends of the earth." (To which our nuncio often adds "Even to Washington... even to the United States of America.") He doesn't say "I want you to be my witnesses," or even "You should be my witnesses" -- he says "You will be," he presupposes it, knowing full well that, two thousand years on, our sins, failings and rough moments would still make the task something difficult, but possible, to the extent that we try to live up to it, to the extent that we not lose heart or throw in the towel when we don't. So the message of this day is a very encouraging one. But there's a challenge in it, too: the formulation "You will be my witnesses" is also a way of saying, "You're what I've got" or "It's all on you." Art, architecture, music, ritual prescriptions and all the other trappings are, of course, ways of manifesting the charge, yet we don't hear that these are the things on which the message's heeding rises or falls -- we hear that the responsibility lies squarely on us, wherever we are, whatever we're doing. It's just further impetus to keep in mind that, for everything else we've got that adds to the package, the church is built firstly and foremostly with living stones. Its life isn't about any one of us more than the rest, but at the same time, it wouldn't be the same were any of us absent from it. And the more stones there are, the stronger it is. That's just something to keep in mind, but I've already said too much, and as preaching is best left to the pros, here endeth the lesson. On a housekeeping note, while sermonizing is beyond my purview, I've been spending the last couple days (and will be spending the next couple) holed up on the next big talk, this time to the National Catholic Young Adult Ministry Association's annual forum on Staten Island next week. Barring anything breaking, in the meantime posting will remain light.